Monkey Bread is delicious, but add Hershey Kisses wrapped inside the flakey biscuits covered in cinnamon sugar and we get a Chocolate Monkey Bread recipe that will blow your mind! 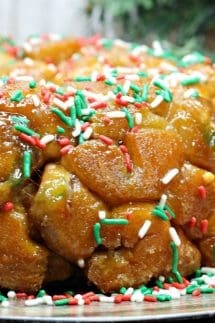 Monkey Bread is a classic recipe that I recently discovered. It is basically refrigerated biscuits, coated in cinnamon sugar and covered with a delicious caramel sauce. But this monkey bread recipe is different than our classic Monkey Bread Recipe. We are adding a new element into it! Chocolate! We’re not talking just drizzling chocolate over the top of the monkey bread, we are going all in! Literally! We are wrapping the biscuits in Hershey Kisses, so each and every bite is guaranteed a happy ending, hence…Chocolate Filled Monkey Bread! Looking for another easy dessert recipe, but need some more chocolate involved. This Crockpot Candy Recipe involves chocolate, peanuts and all things delicious! 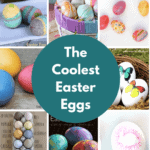 What I love most about it is how easy it is to make and how hard it is to mess up! It is best served warm and then grab some friends and literally digs in. It is like a pull-apart bread on steroids! There are different schools of thought on how to make monkey bread. There is the how to make monkey bread from scratch camp and then there is mine! How to make monkey bread using canned biscuits! If you love Monkey Bread you are going to love our Chocolate Chip Banana Bread and our Cinnamon Sugar Cheesecake Bars. As I mentioned, the beauty of Monkey Bread is how easy it is to make. Each bite is guaranteed a delicious oozing bite of chocolate! 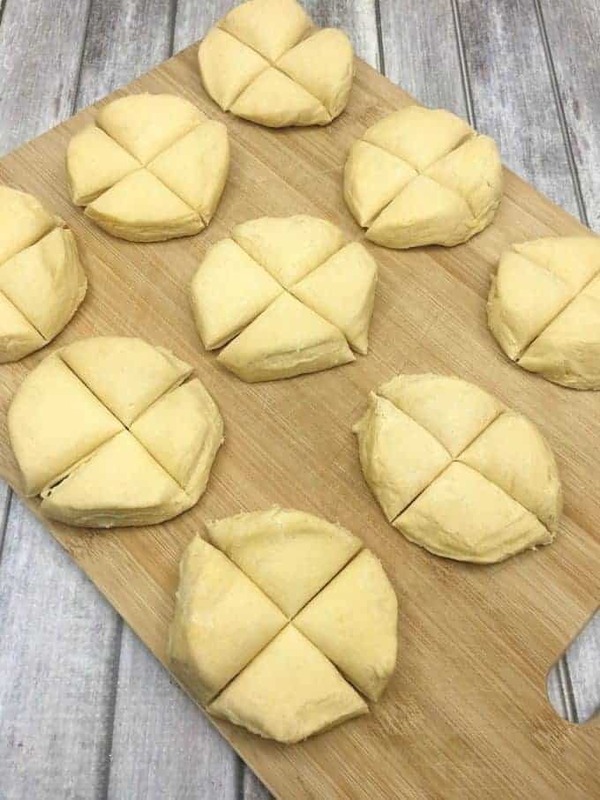 The first step is to separate your dough pieces into quarters. Then slightly flatten them out. 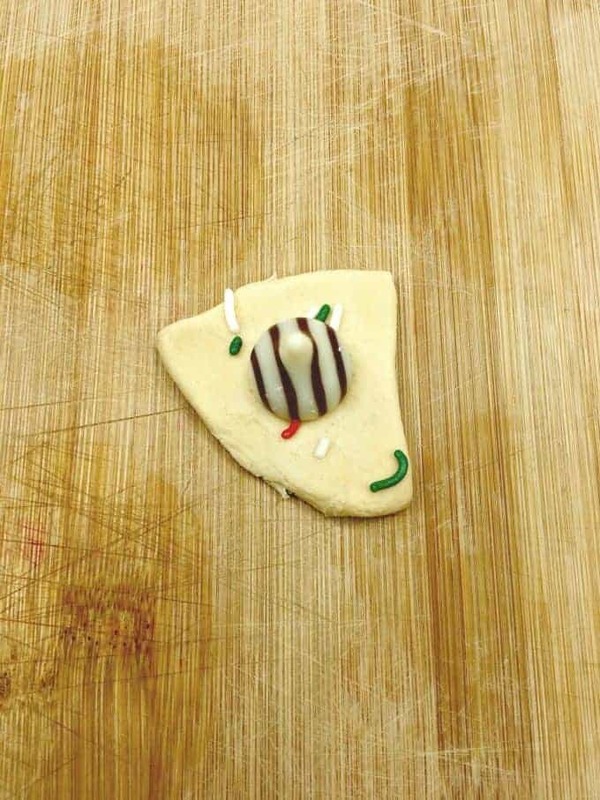 Place some Christmas sprinkles (or any other type of sprinkles) on the quartered biscuit. 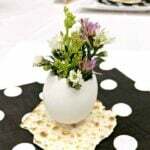 Place one Hershey Kiss in the center of the biscuit and roll the biscuit into a ball and set it aside. Repeat this step with each of the biscuits. Pour the cinnamon and sugar into a ziplock bag. 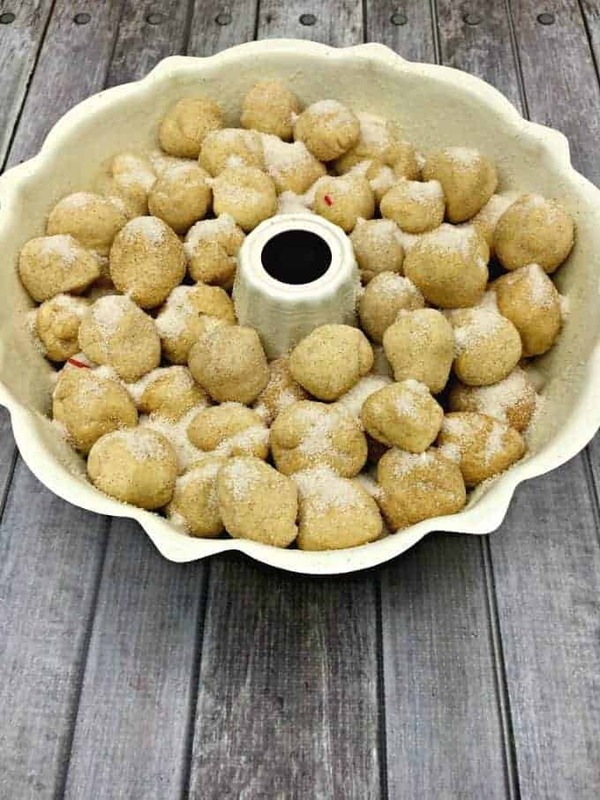 Place all of the biscuit balls into the ziplock and zip it closed. Shake the bag until all of the biscuits are covered in the cinnamon sugar mixture. Remove the balls from the bag and place into your bundt pan. In a medium saucepan, melt the butter and brown sugar together until fully melted. Pour the caramel sauce over the biscuits, coating as evenly as possible. Place the top of a plate onto the top of the bundt pan and turn the monkey bread over onto the plate to remove from pan. 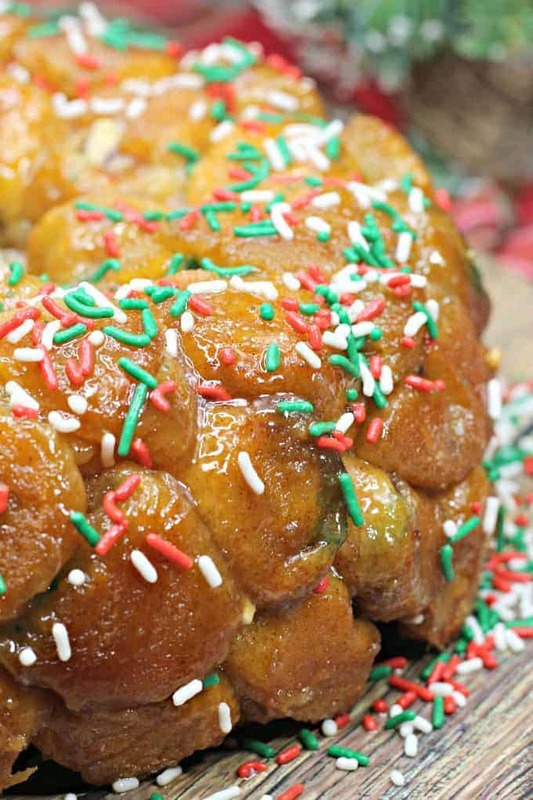 Sprinkle some more Christmas sprinkles all over the monkey bread before enjoying! 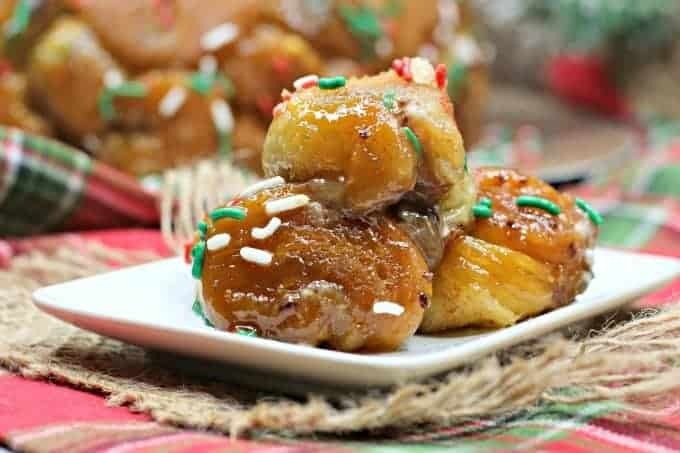 Add different Hershey Kisses or Sprinkles for different holiday Monkey Breads! In a medium sauce pan, melt 1 cup of butter and 1/2 cup of brown sugar on medium heat. Mix unitl melted. Spoon some of the caramel sauce in to the bottom of the bundt pan (just enough to coat the bottom of the pan). Pour the sugar and ground cinnamon into the ziplock bag and shake to combine.